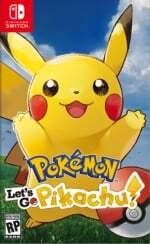 In the lead up to Pokémon: Let's Go, Pikachu! and Let's Go, Eevee! next month, Nintendo's UK YouTube channel has released a new trailer. This fresh clip shows some new locations and scenes that haven't previously been displayed. It also provides a glimpse of the character customisation feature - including the ability to change skin tones. Apart from this, there are many Pokémon on display including the legendary birds and Mewtwo, as well as a look at some of the original gym leaders. Take a look above trailer above and tell us if it's got you excited for the release of these games next month. I've done a compete 180 on this game. I'm so pumped. Takes me back to playing Pokemon Blue as a kid and I love the art direction. Still on the fence but it looks good. It looks like a good time, and I love the little cinematic touches they've added. It's not what I was personally hoping for the first HD mainline Pokemon game, but it's not meant for me anyway since I'm not the target demographic to begin with. I'm perfectly content with waiting for the 2019 game. Long time no see Mewtwo. I can't wait to play this! I've been with the series since Pokemon Blue and getting to revisit Kanto in HD with my fiance is extremely exciting. Sure, I wish there were wild battles and sure I'm more excited for 2019's Pokemon game, but this still looks like a great time. I can understand people who aren't hyped for this. If my situation was different I'd probably feel the same. I have a nephew who recently started reading who loves Pokemon and this is going to be his first Pokemon game. I'm excited to play along side him, trade with him, and most importantly CRUSH WHATEVER TEAM HE HAS INTO THE DUST. He's all cocky about his Pokemon cards with his friends. I never really got into the cards, so this is finally my chance to put him in his place. But really though, this'll be his first Pokemon adventure. I'm mainly excited to see what his progress looks like on that adventure. This game is mainly for him. Pokemon 2019 will be all me. More like "Pokemon: Can't Wait!" Removing all grinding and random encounters (fight) with wild pokemon from the game is almost a deal break, almost. This is looking really really good. The post game news sold me on this. PLEASE BE GOOD cuz it's super expensive with the Pokeball. Buying it for the post-game and because Eevee on my shoulder is freaking cool. Loved Pokémon Yellow back in the day so this will hopefully be beyond nostalgic. I'm really happy they got rid of random encounters and wild Pokemon fights. It should make it a more streamlined experience, and less boring than hitting the A button every few seconds while walking in tall grass. This is the first new Pokemon game I've had any interest in for quite a while, since they all seem so similar, and I feel like they're all basically the same thing I've already played, so, had no reason to pick another one up. But, the change in gameplay is reason enough for me to give the series another chance. Good to see they’ve improved the visuals since the last build. The lighting and saturation is so much better! That video actually got me pumped to play this. I pre-order both versions and pokeball controllers for my kids but held off on getting myself a copy. I don’t love all the changes to the gameplay but i May cave and end up buying myself a copy. As someone who was about 12 when Gen 1 came out, Kanto pulls hard at my heart strings. @dimi There is still plenty of Grinding other trainers, pokemon themselves never equated to much exp anyways. I'm trying super hard to save back enough money to get this at launch. It looks sooooo good!!!! Eevee all the way! I keep changing my mind about these; one minute I find them skippable, the next I'm getting hyped about some new info. It'll be a bit before I play one of the two (still leaning towards Eevee) in any case as I'm still Switchless and still need to play Ultra Sun anyway.